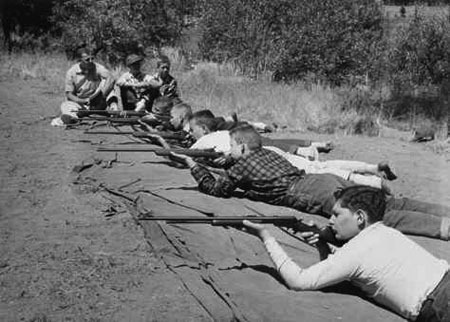 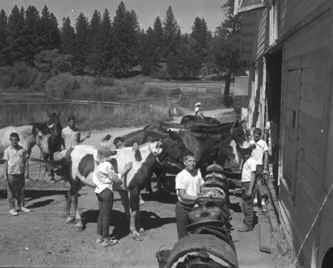 Our secluded valley, now home to Mountain Meadow Ranch California Summer Camp, was once a favorite hunting camp for the Maidu Indians. 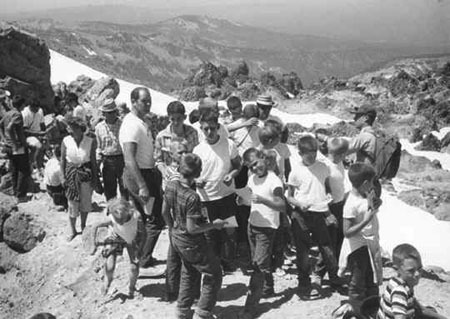 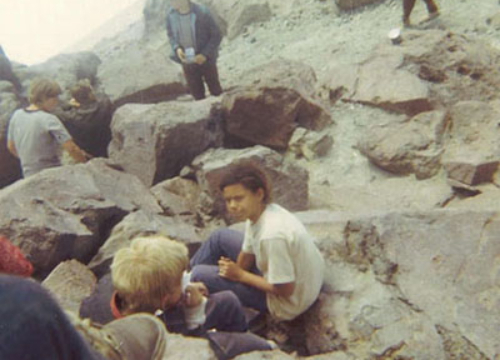 As time moved on the faces of the hunters changed but the popularity of the area remained. 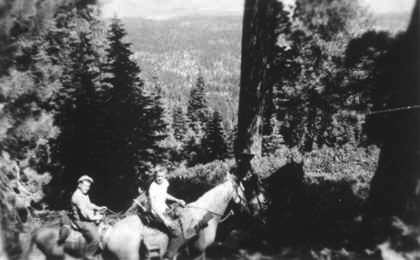 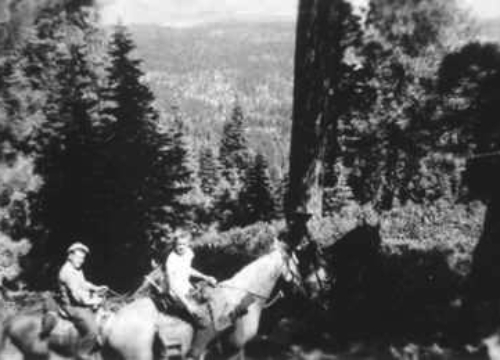 In 1910, a wealthy bear hunter from Reno built a permanent summer retreat here. 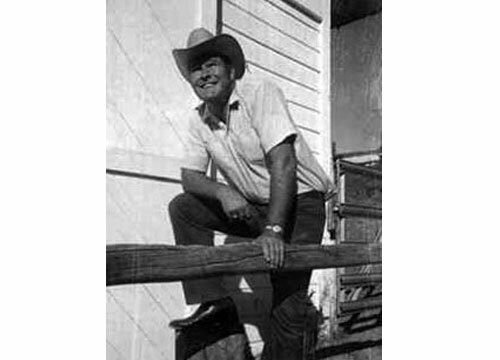 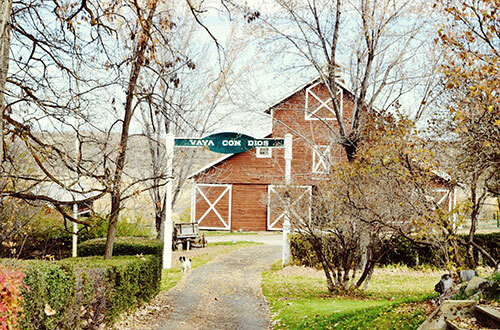 George Wingfield, who made his fortune in the Nevada gold fields, created a ranch that became the showplace of his time. 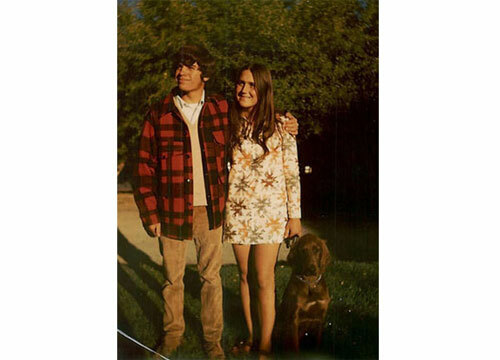 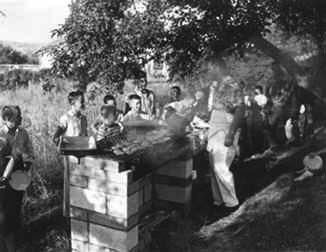 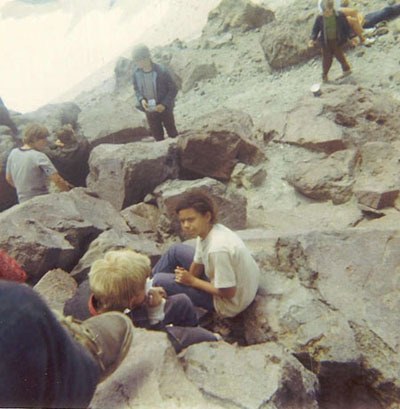 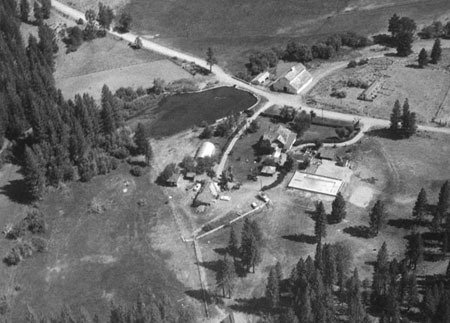 People came from miles around to see his beautiful estate with his own deer, buffalo and elk grazing in the meadows. 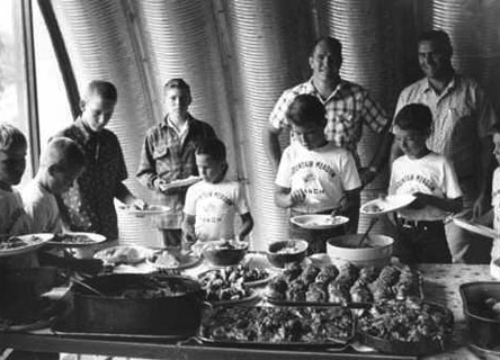 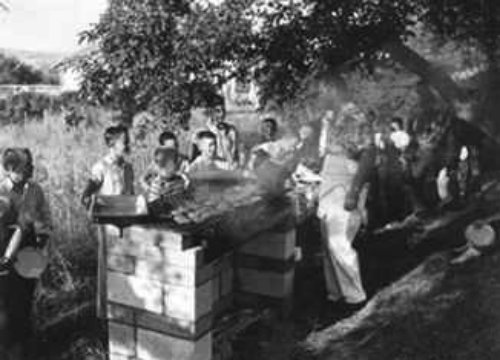 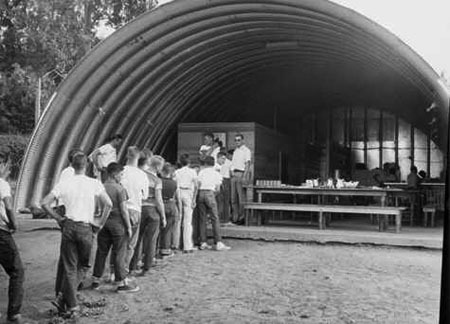 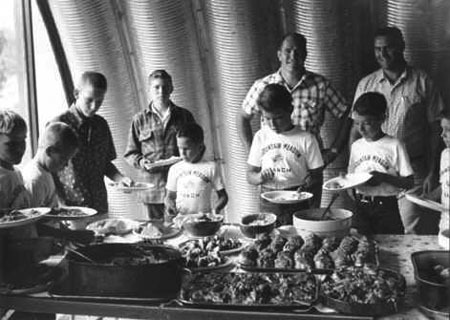 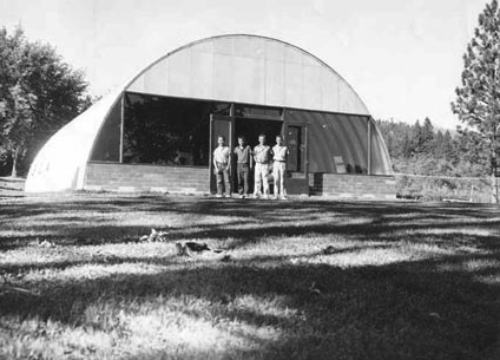 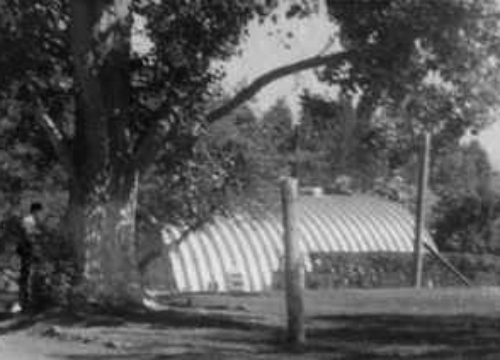 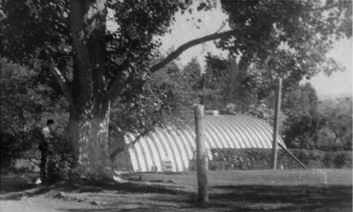 The Quonset Hut - our original dining hall! 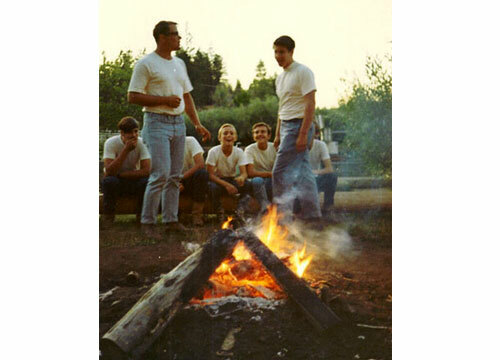 the late '60's before finally reaching it's permanent home in the meadow. 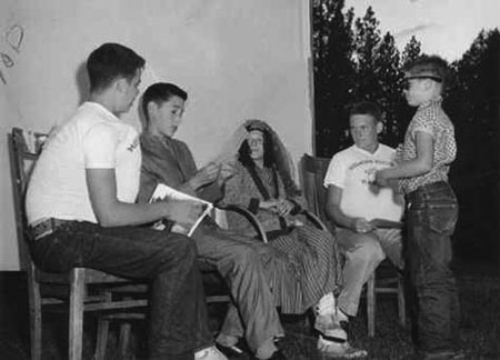 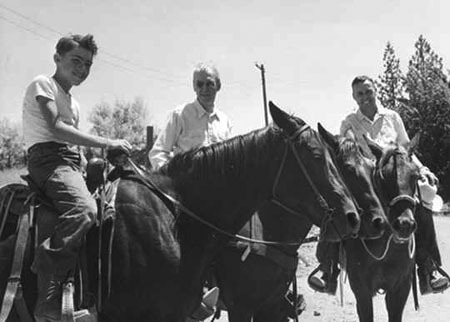 John Schwall, "Tex" Britten (counselor), Billy "Tacky" Ellena, and Duane. 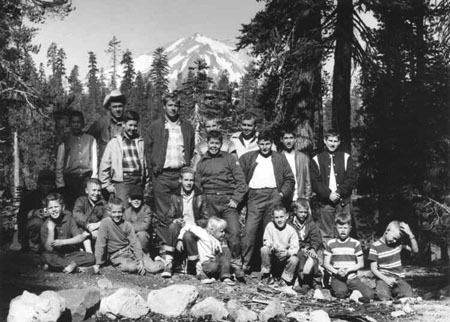 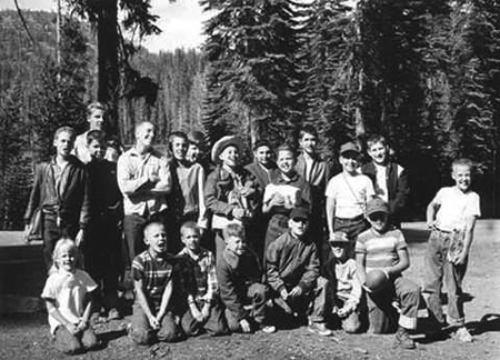 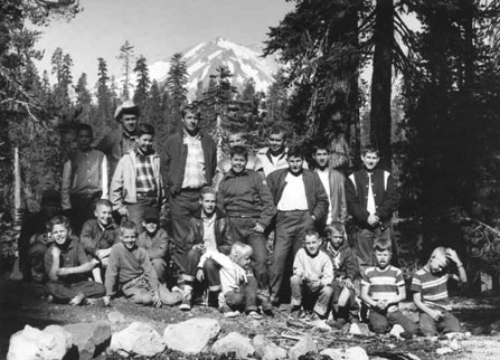 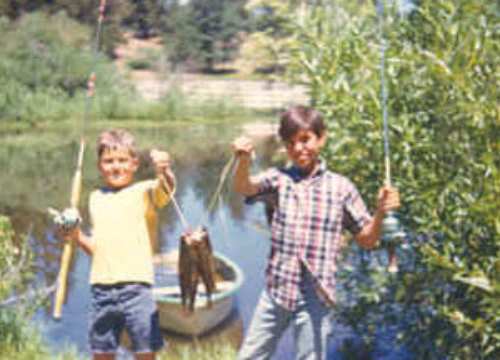 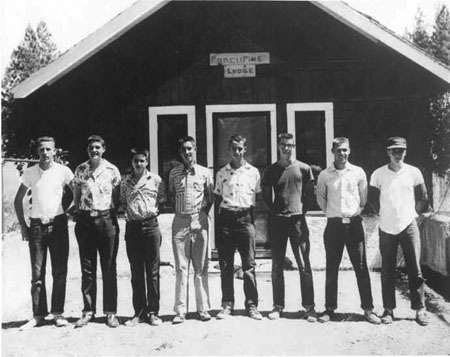 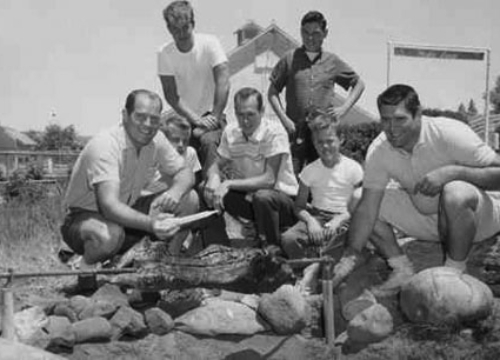 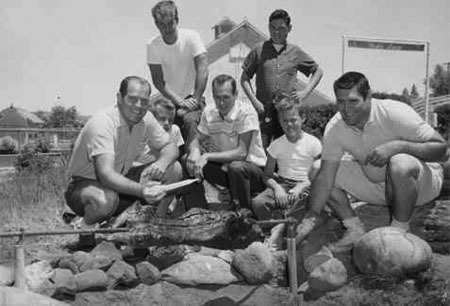 The Boys of the Porcupine Lodge, later to be known as the Modoc cabin! 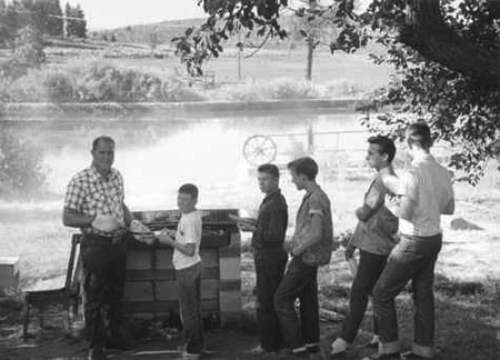 Inspection was tough in those days...but it was done with a smile. 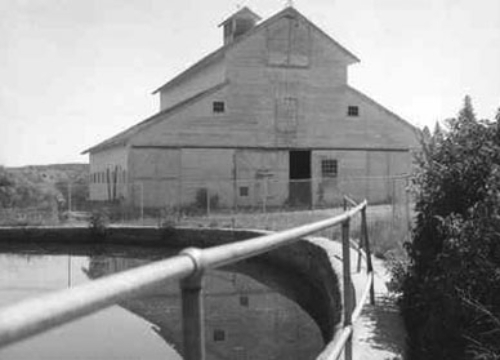 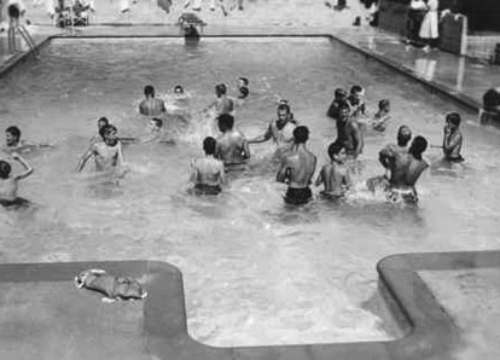 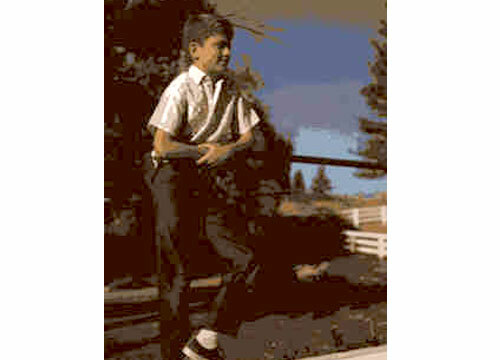 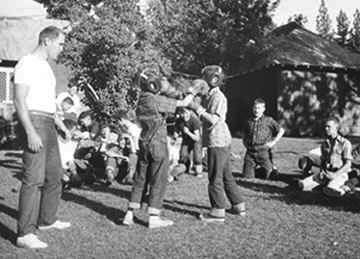 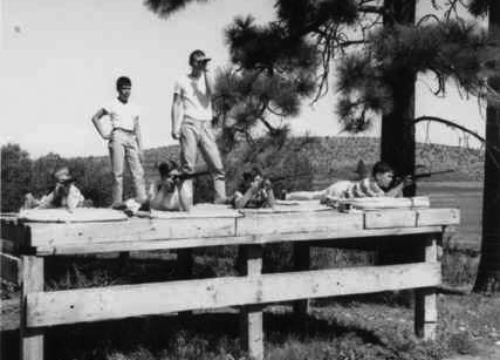 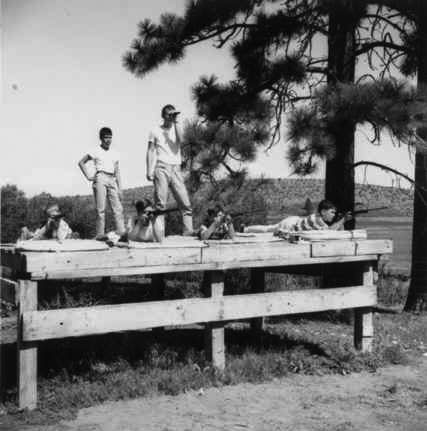 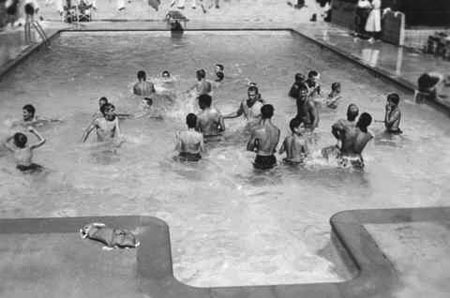 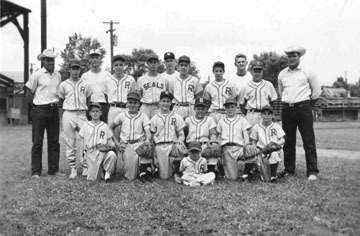 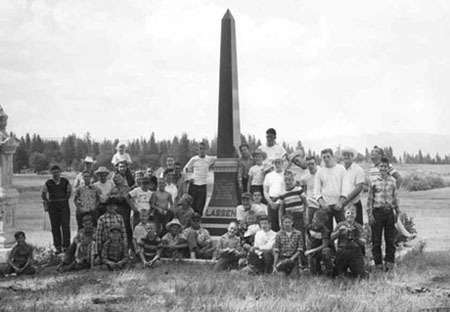 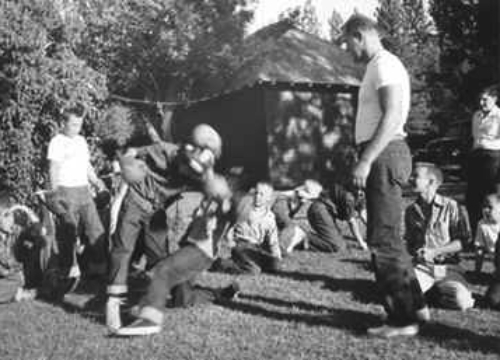 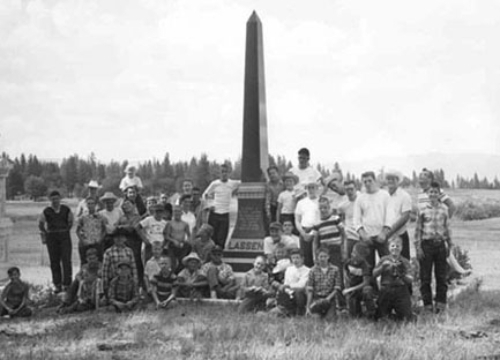 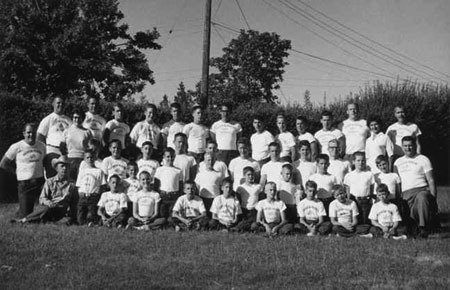 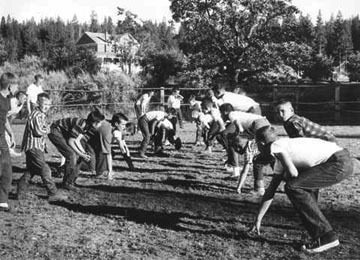 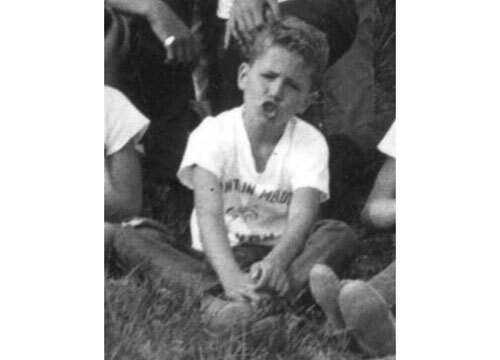 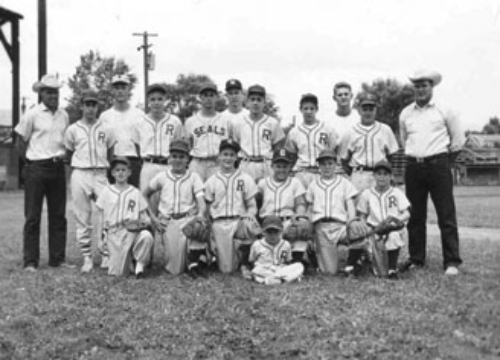 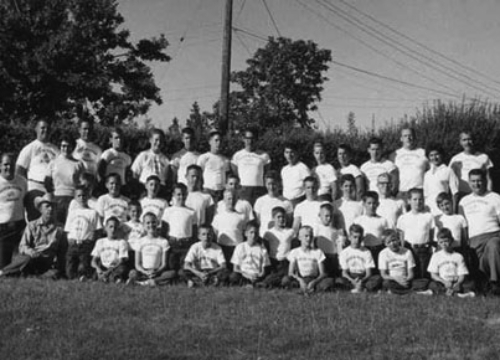 This was riflery in 1956; the first platform was built in '57 or '58. 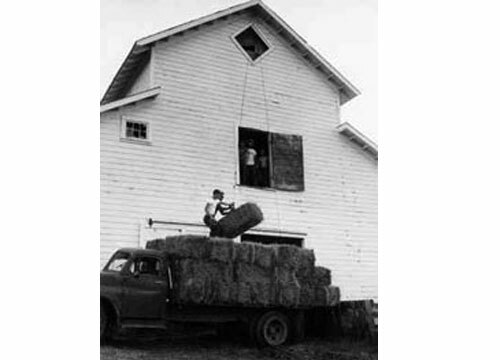 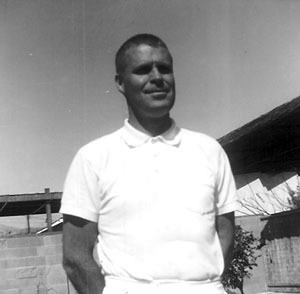 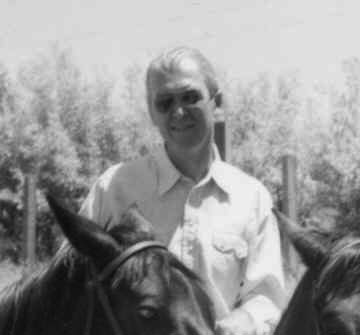 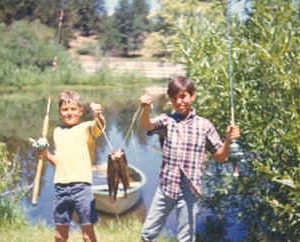 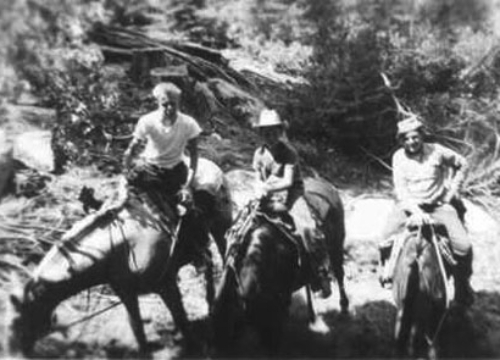 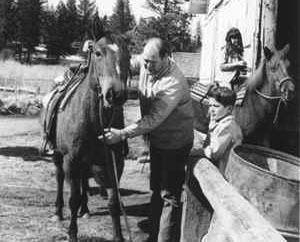 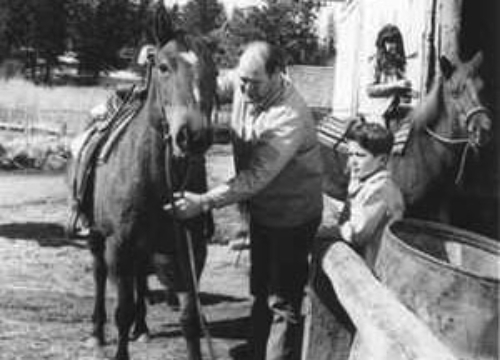 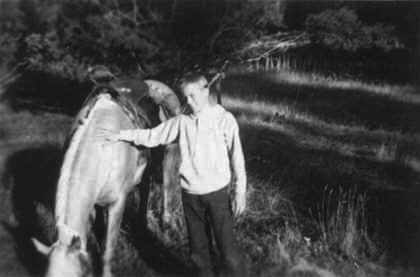 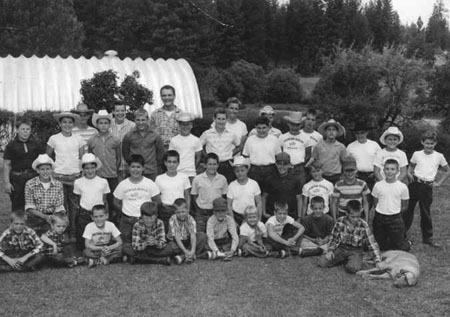 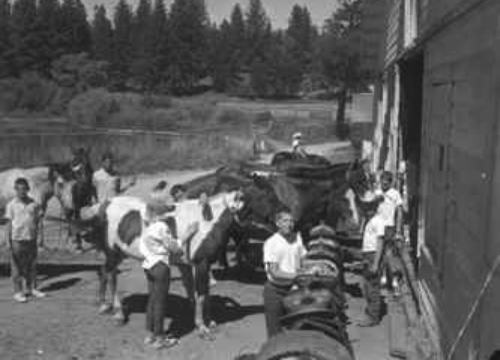 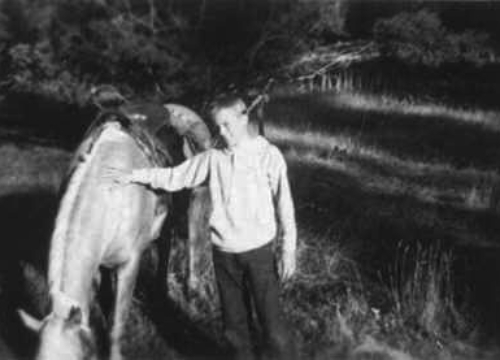 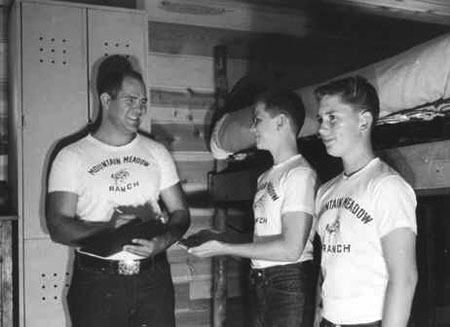 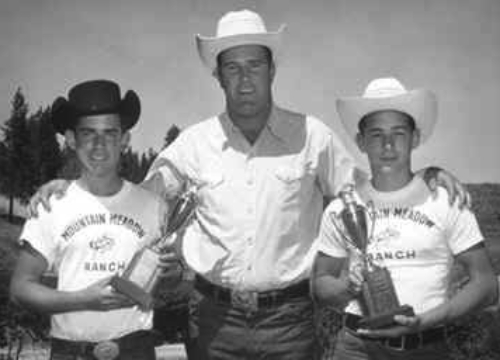 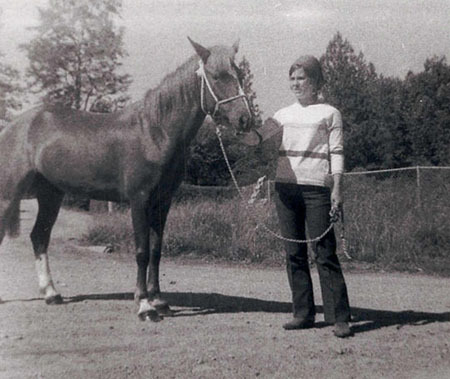 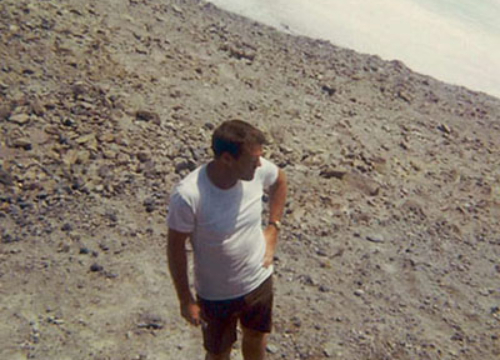 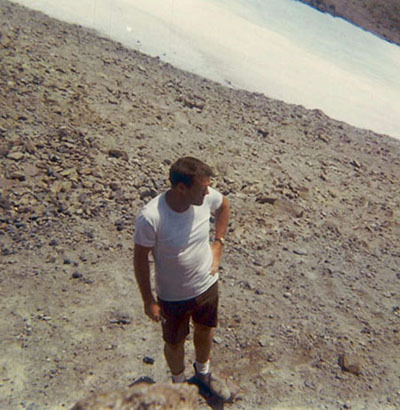 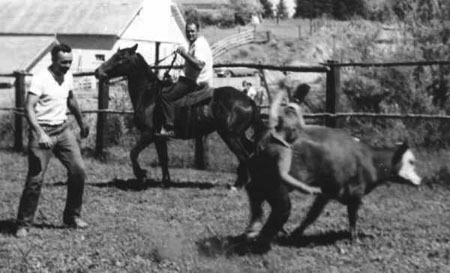 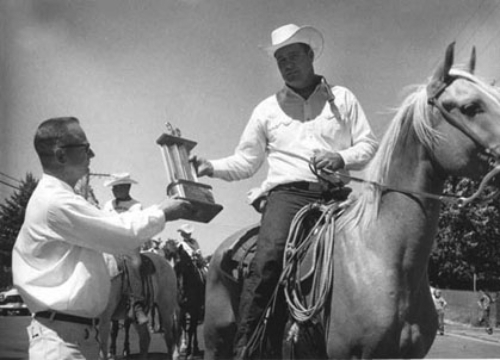 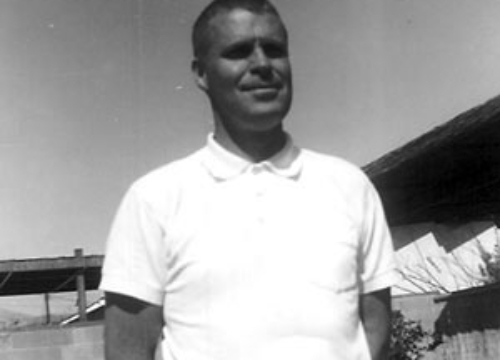 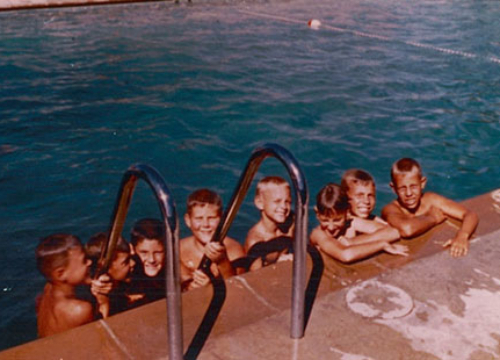 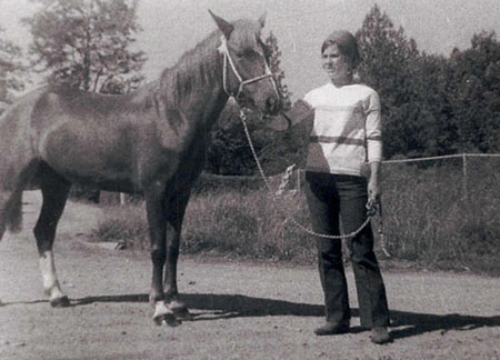 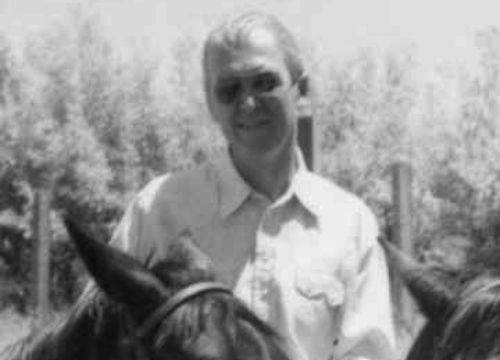 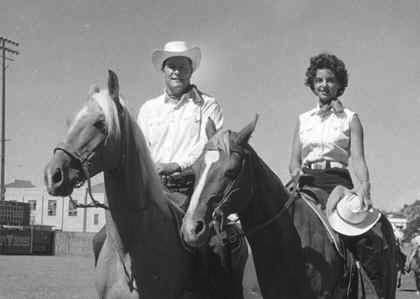 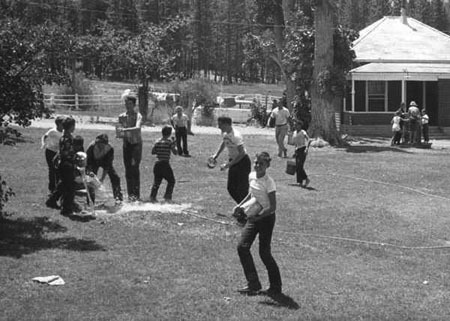 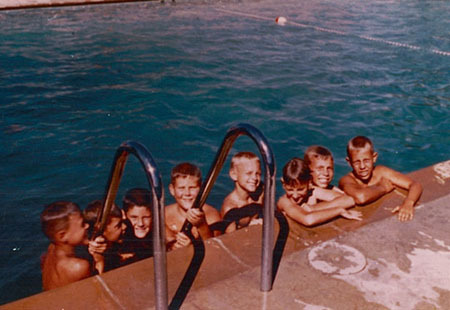 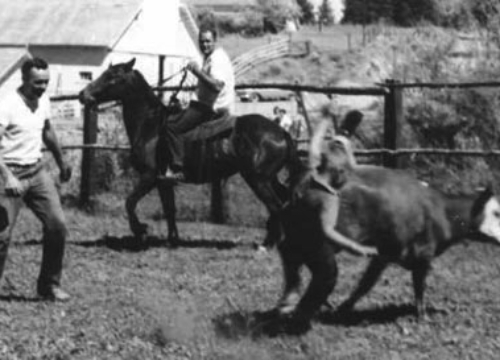 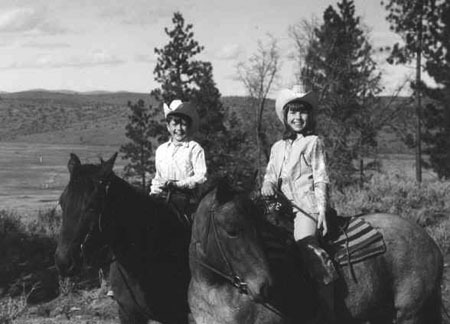 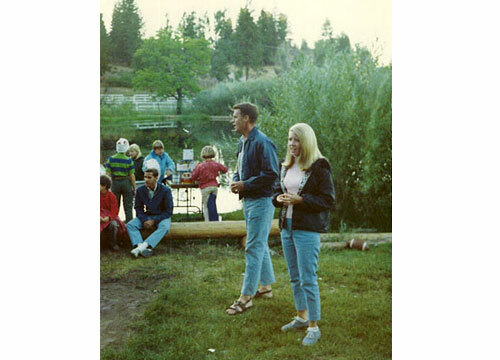 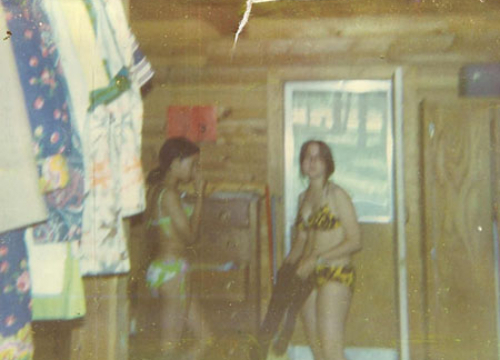 at Mountain Meadow Ranch in the late 50's. 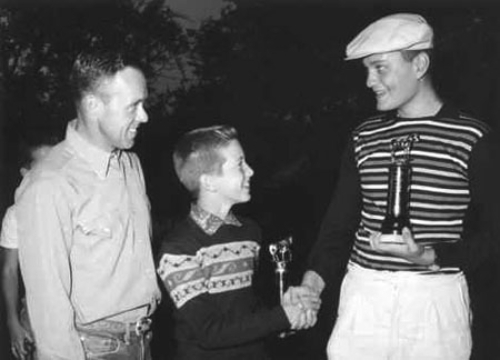 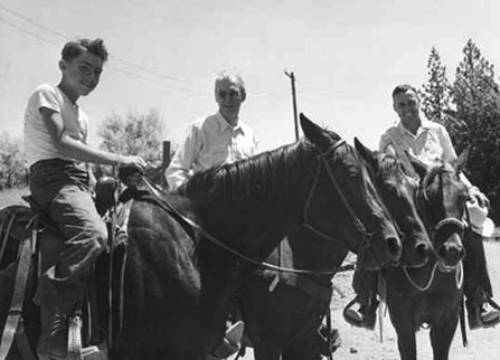 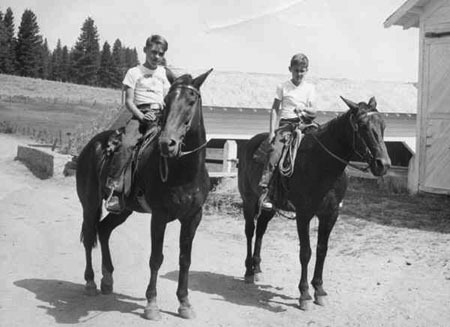 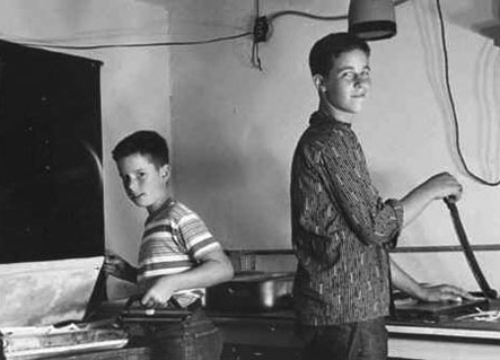 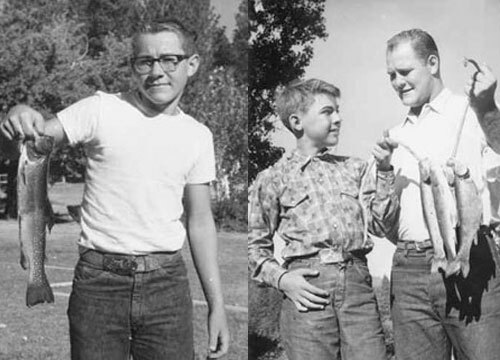 Jimmy Stewart (in center) with son Ron at left and an unidentified friend. 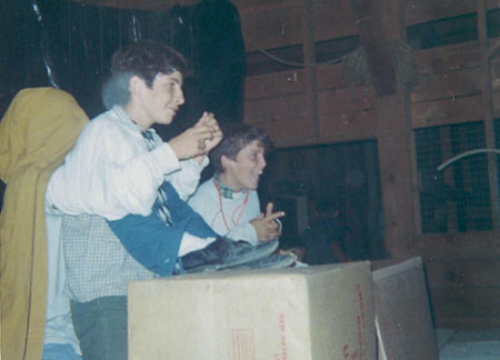 Whoopie Ti Yi Yo! 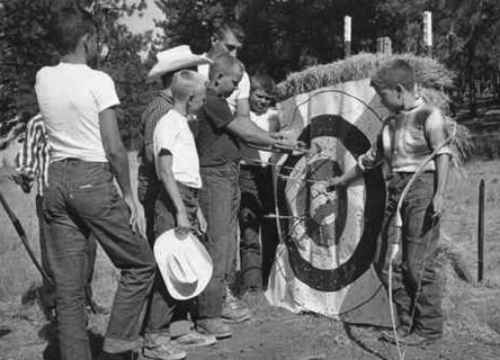 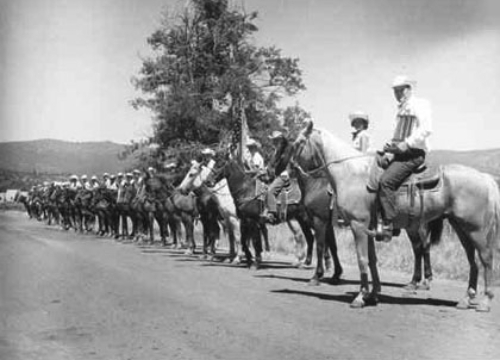 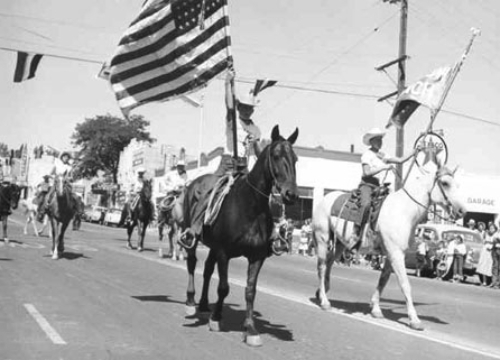 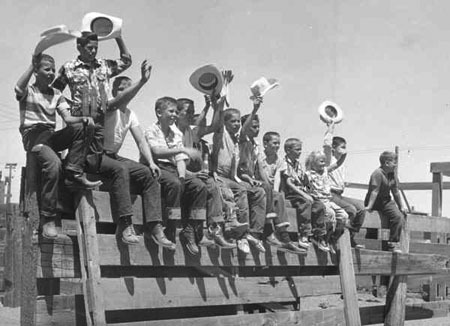 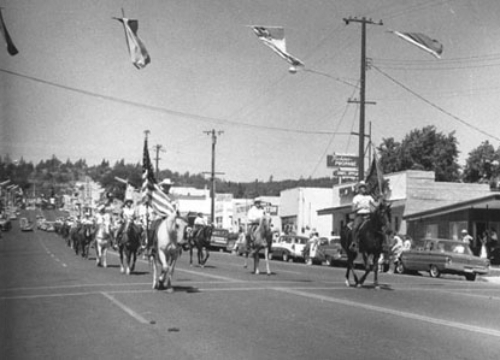 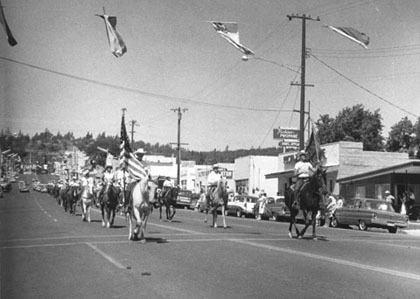 Cowboy Day in the late 1950's...ain't changed much! 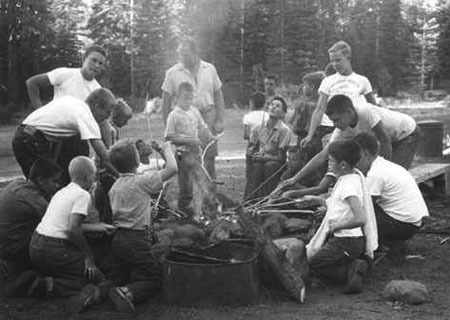 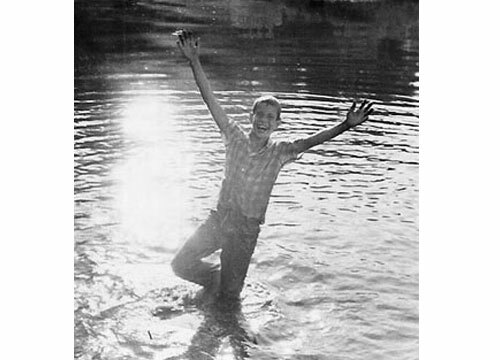 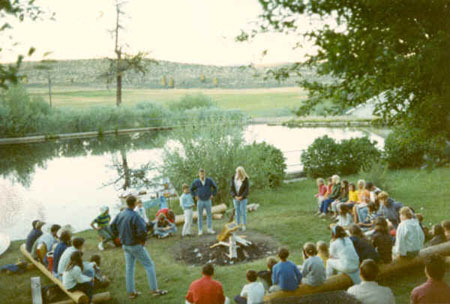 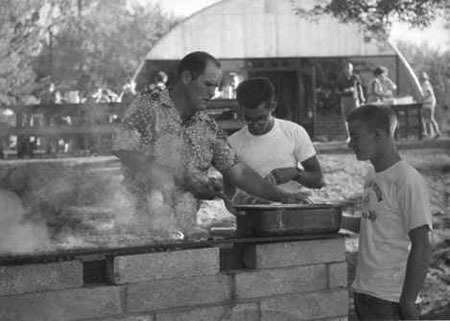 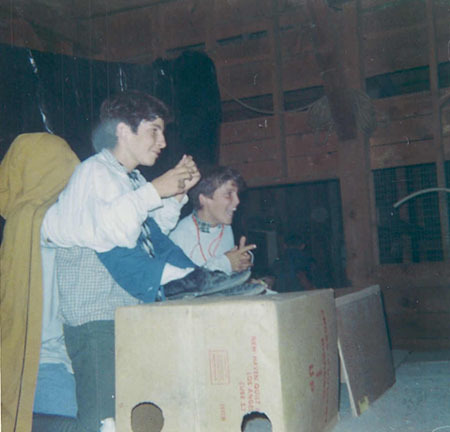 "There's nothing better for the inside of a boy than the outside of a horse..."
This was the original location of the campfire area as it was in 1968.